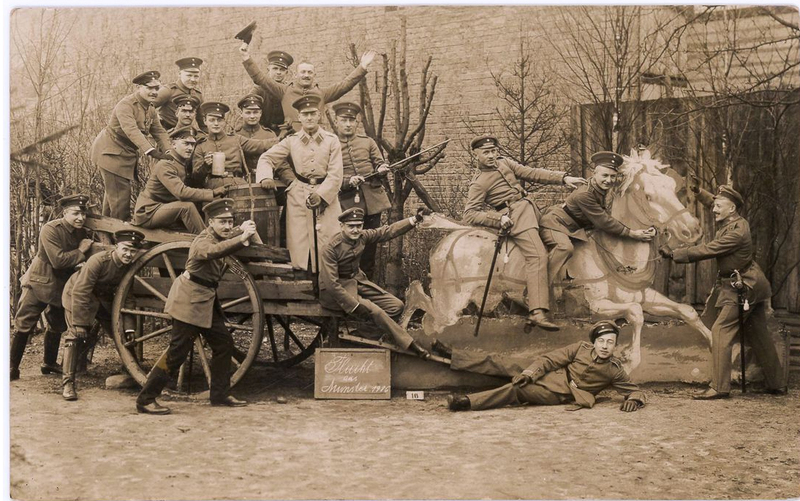 World War 1 Soldiers Posing With Fake Military Props. 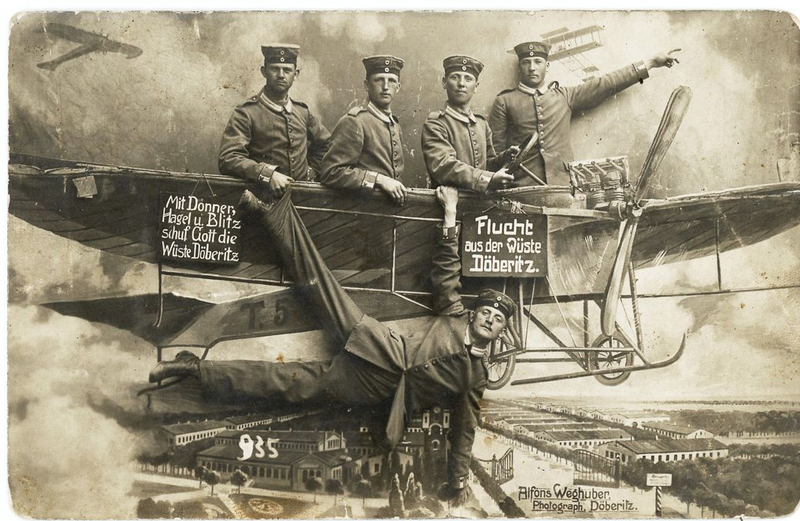 "Flight from the sand desert [i.e., military camp] Neuhammer." Nuehammer Miltarty Camp, Germany. 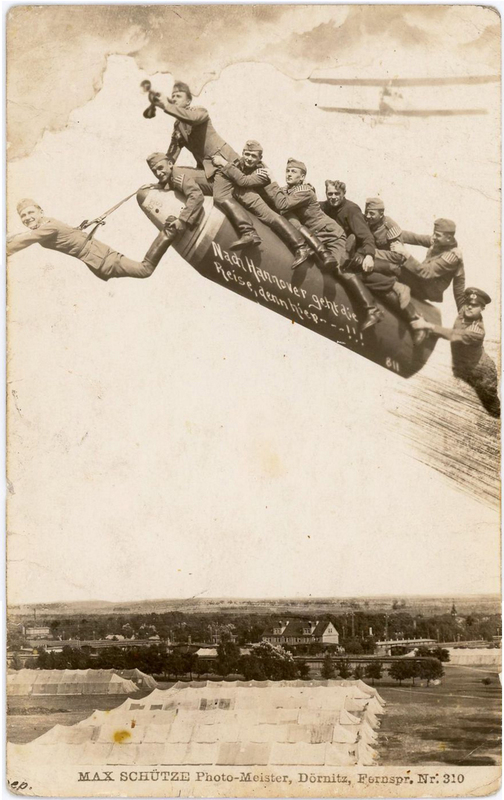 popularity gained traction at the outbreak of World War I in Europe. 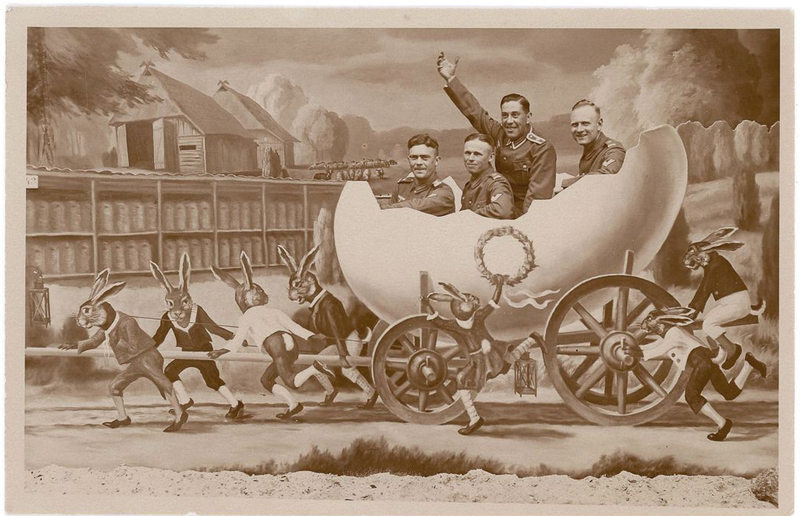 arcades and amusement parks for soldiers on leave. 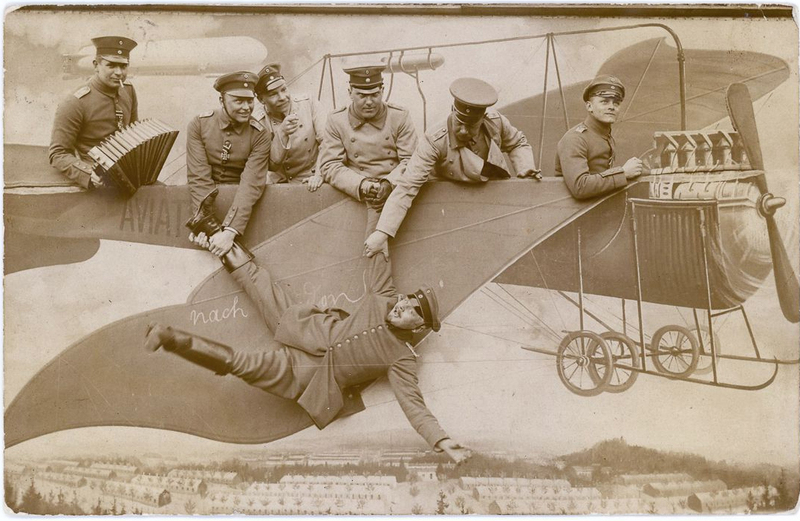 capture moments of both folly and formality. 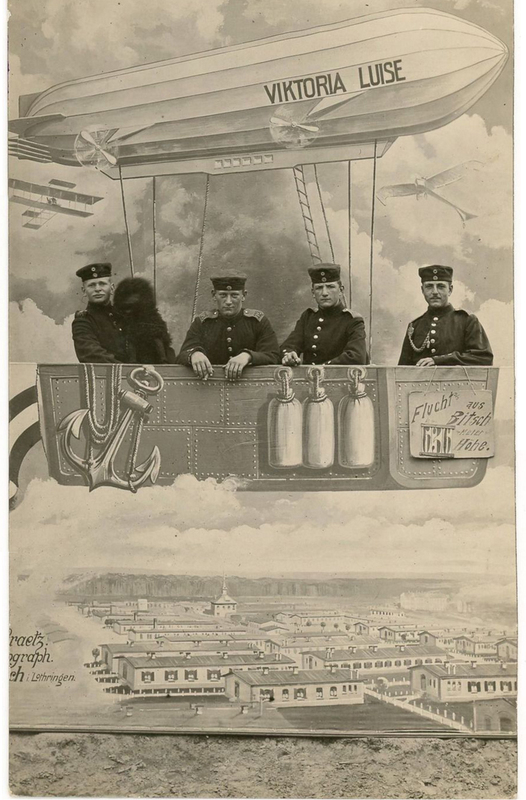 The juxtaposition of faux props and real people is often curious and visually confounding. 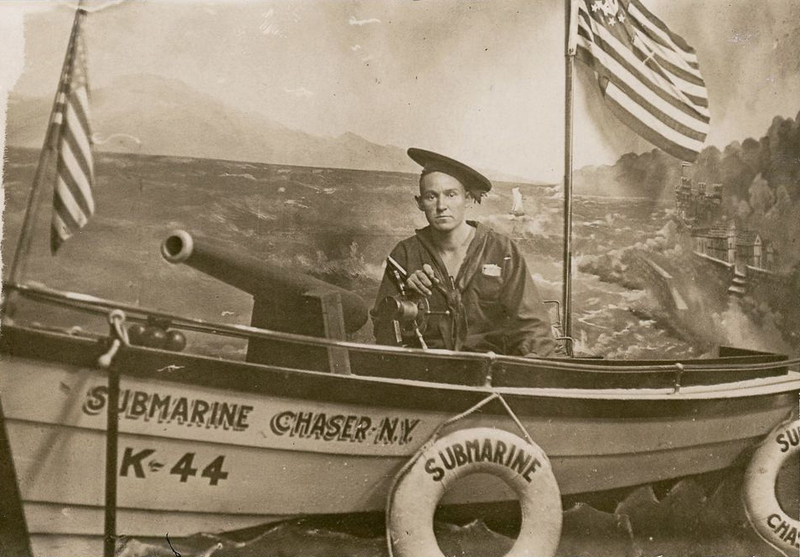 The photographs range in time from the beginning of World War I to the close of World War II. Holland, the United States, and the Baltics. 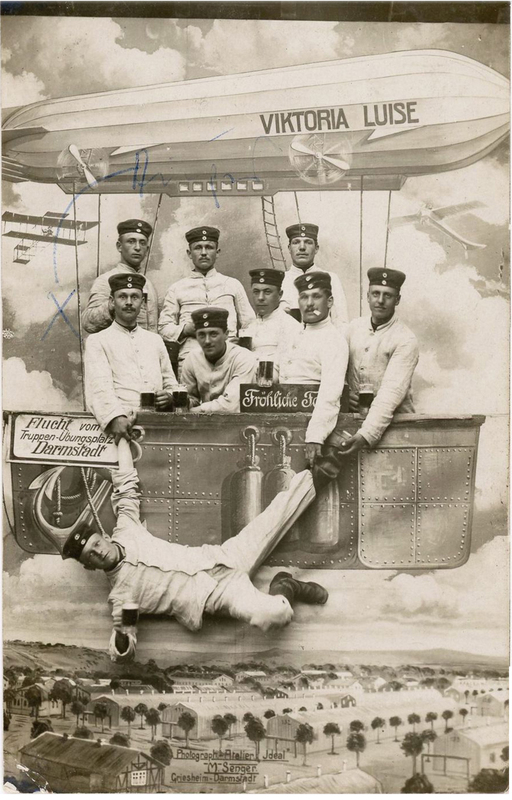 souvenir portraits capture moments of camaraderie and humanity. 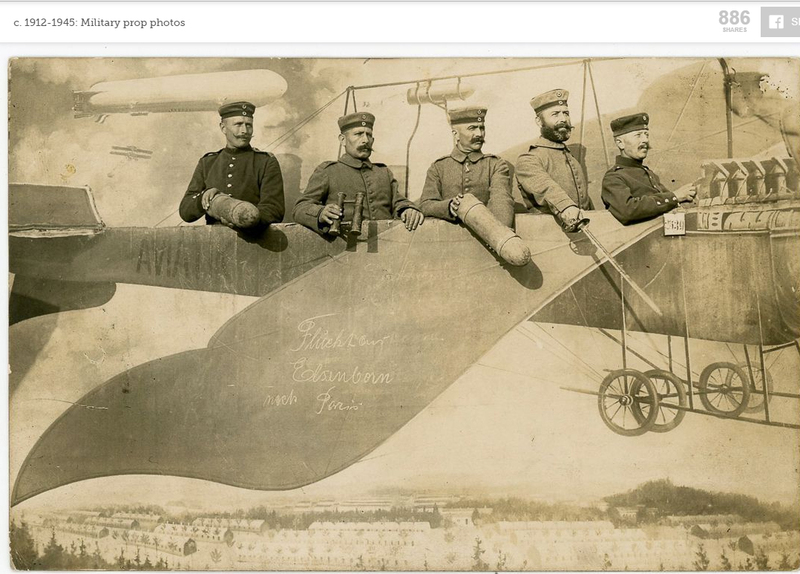 "Flight from Elsenborn to Paris." Trupppenubungsplaz (military training grond), Elsenborn, Germany. "Hooray. 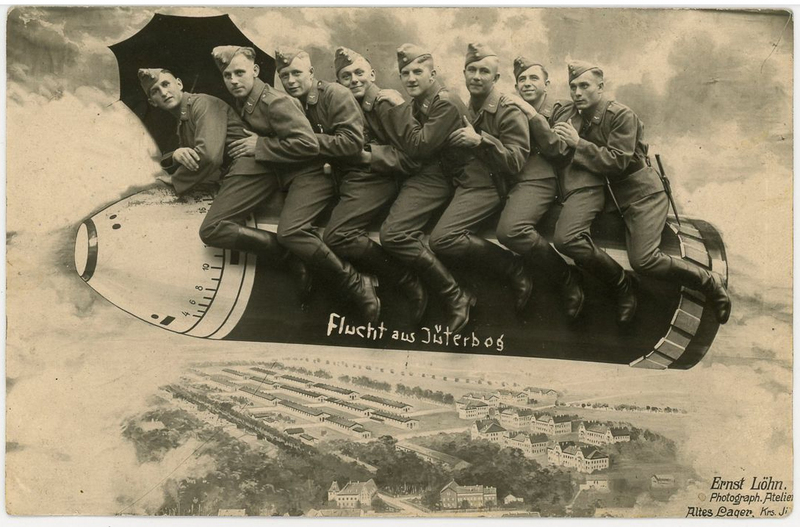 [This] unit has 22 days left"
"Reserved Flight Home from Bitsch." "Those who remained faithful to their mother can be seen fling frome here." Military traing ground, Neuhammeram Queis, Germany. 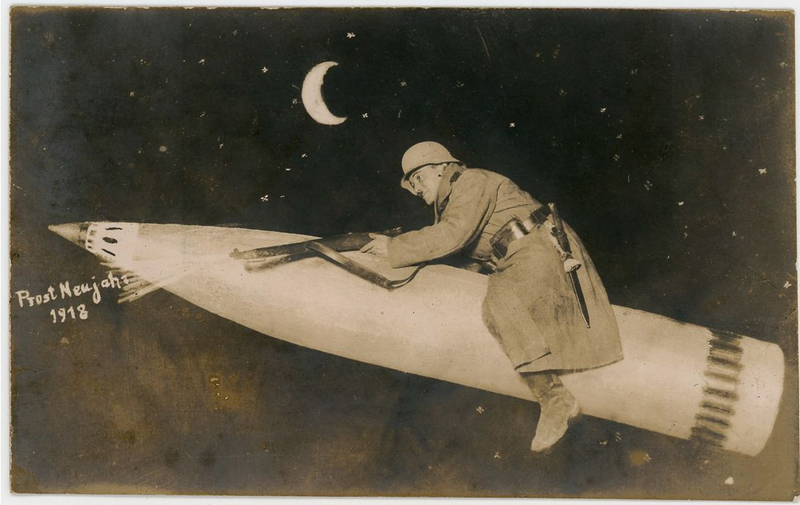 "Escape from san desert [military camp] Neuhammer. Neuhammer, Germany." 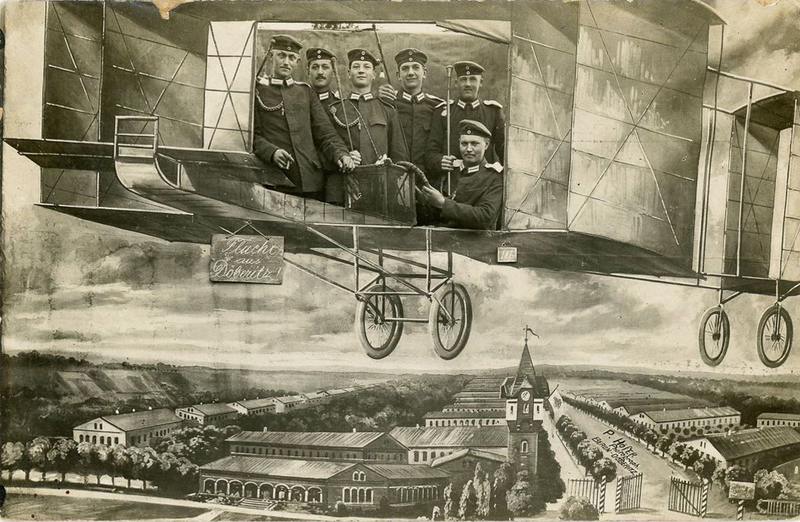 "Flight from Doberitz." Berlin, Germany. 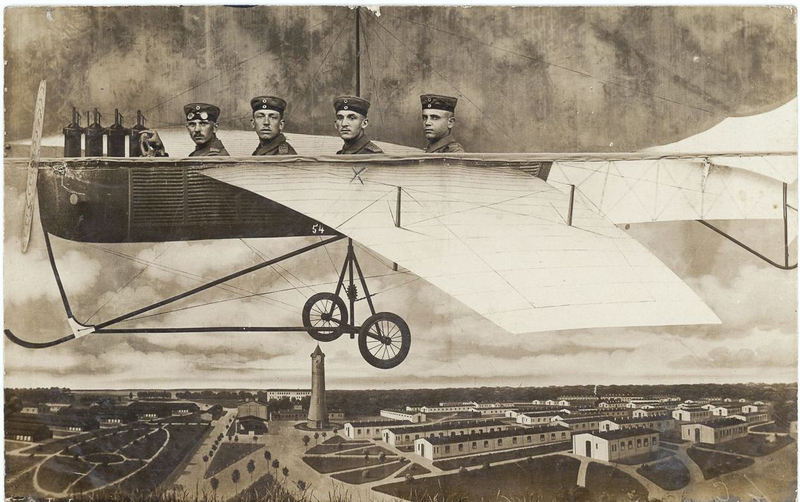 "Flight from Desert Doberitz. 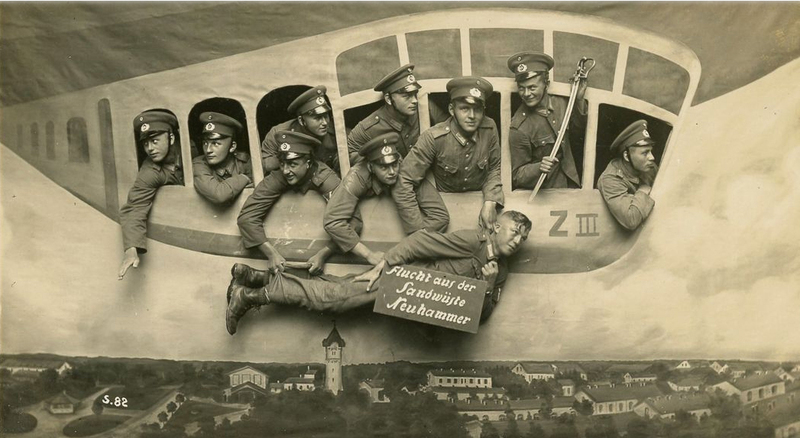 "Doberitz Military Training Camp (aka "Desert Doberitz"). 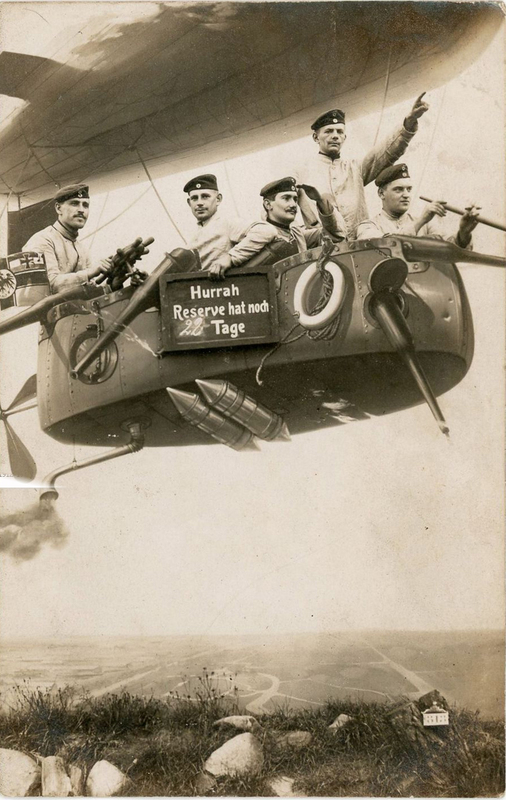 "Flight from Desert Juterbog." Teltow-Flaming district, Germany. 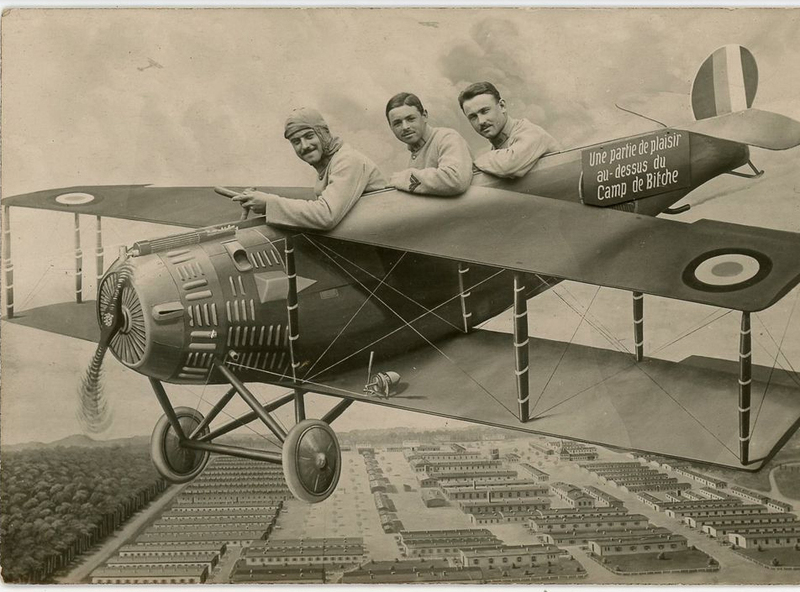 "Flight from the Military Training camp at Darmstadt." 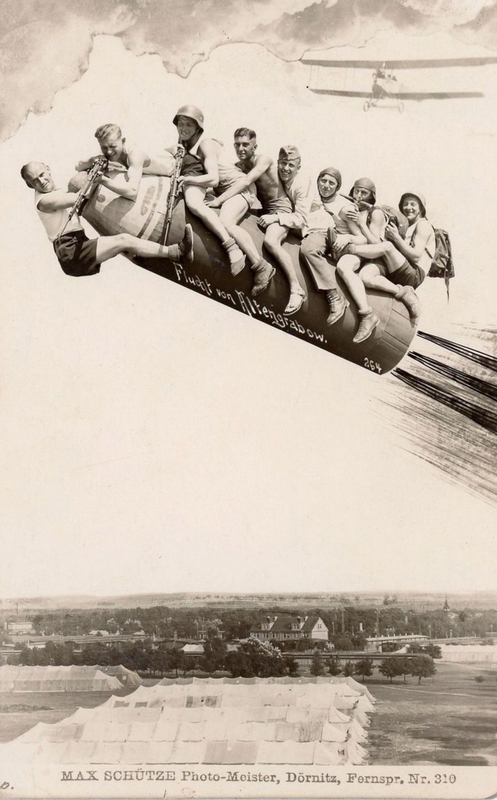 "Escape from Munster." 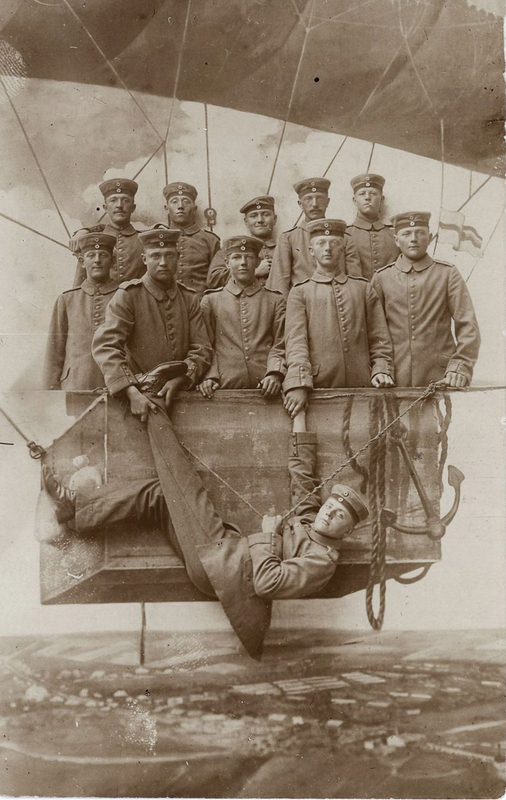 Munster Military Camp, Germany. 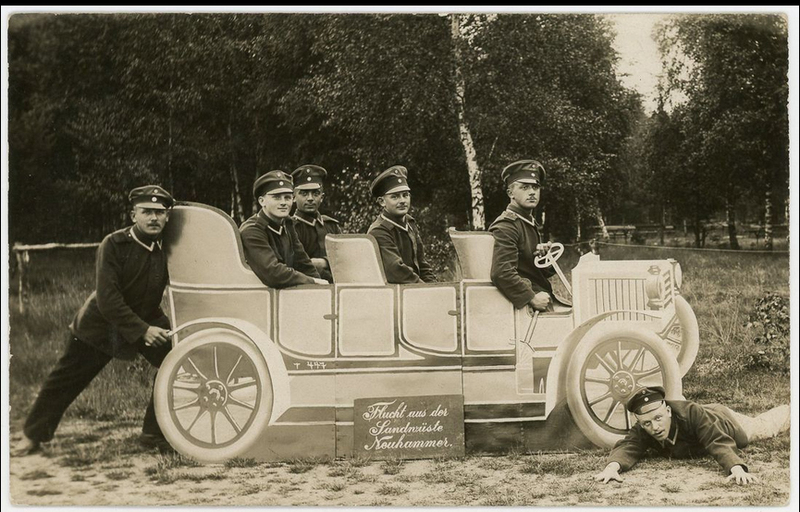 Figure 25 Munster Military Camp, Germany. The "s 11"symbol on the two beer barrels denotes a paragraph from German "Beer Code,"
which reads "Es wird fortgesoffen" or "Keep on drinking." 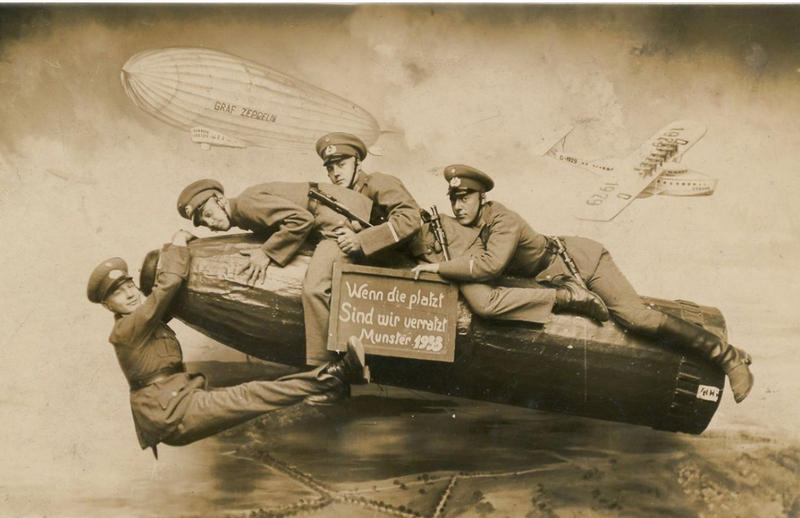 German soldiers on faux Easter egg prop. Camp de Bitche, Department de la Mosel France. 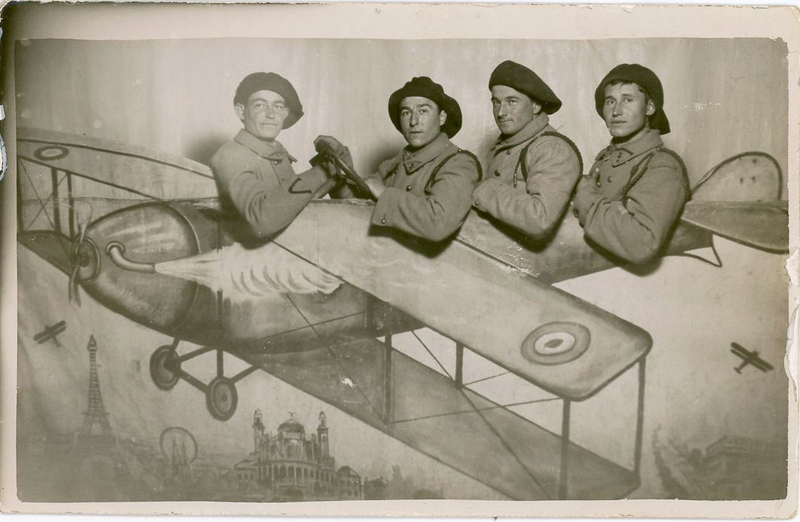 French military aviators in painted biplane studio prop, with Eiffel Tower and the Trocadero Palace in background. Coney Island Amusement Park, New York. 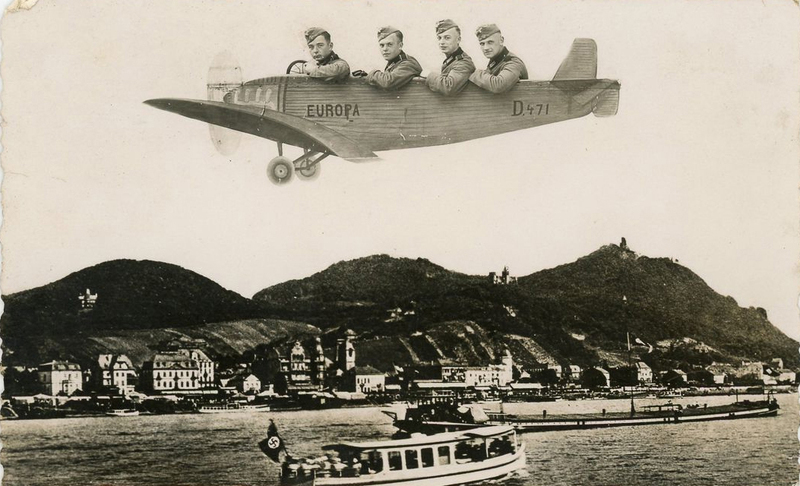 Nazi officers in photomontage single-propeller plane. "If this thing bursts we are done for." 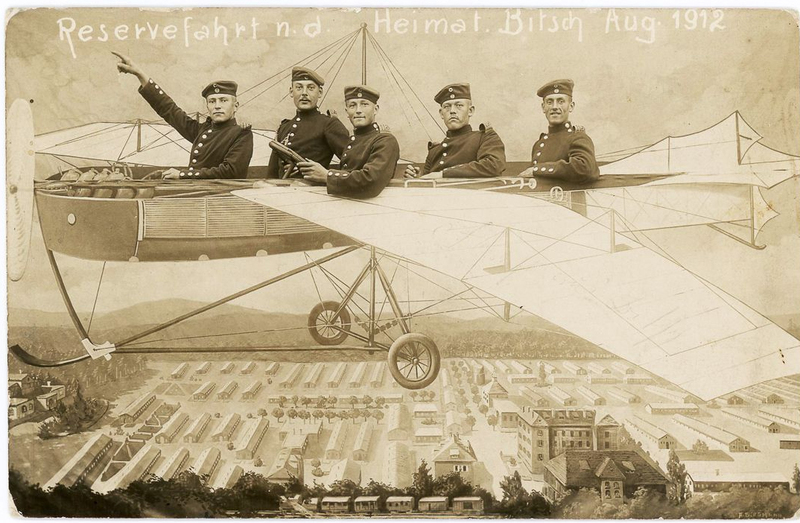 "Flight from Bitsch at 636 meters altitude." 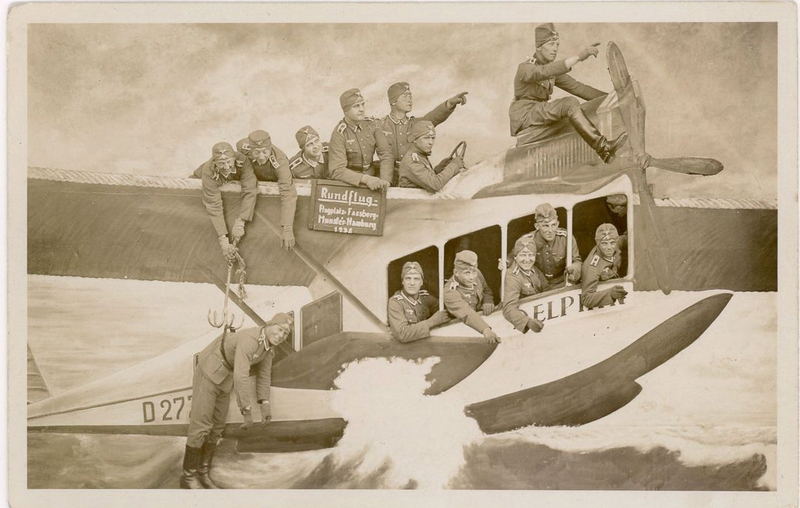 Soldiers with mascot on a painted studio prop of the Viktoria Luise Zepplin, Bezirk Lothringen, German Lorrain. 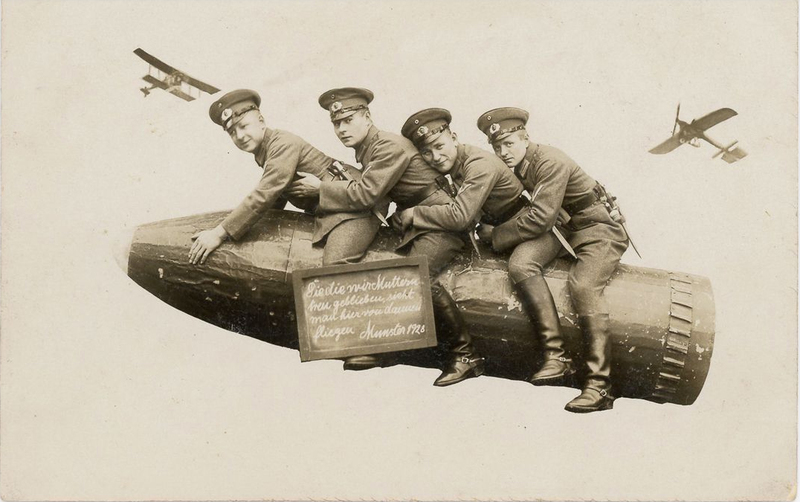 "The trip to Hannover is here." 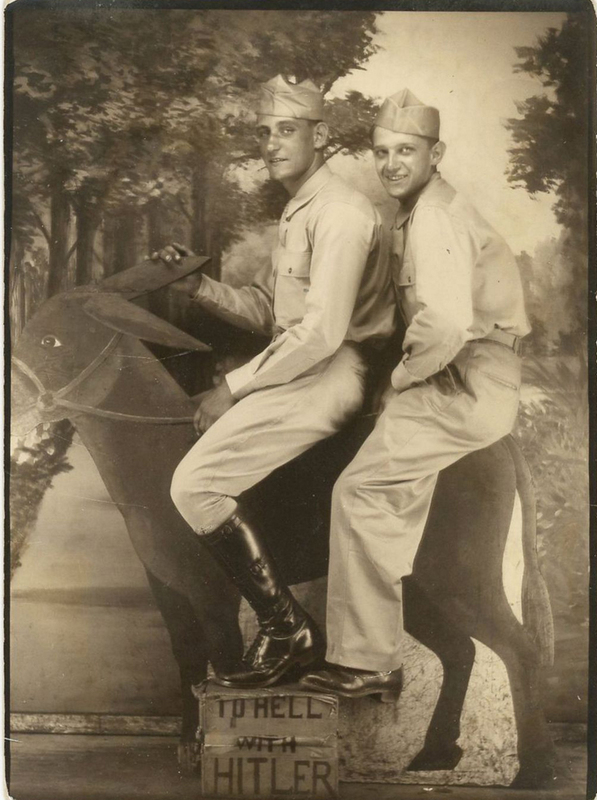 Dornitz Military Camp (Atengrabow) Germany. 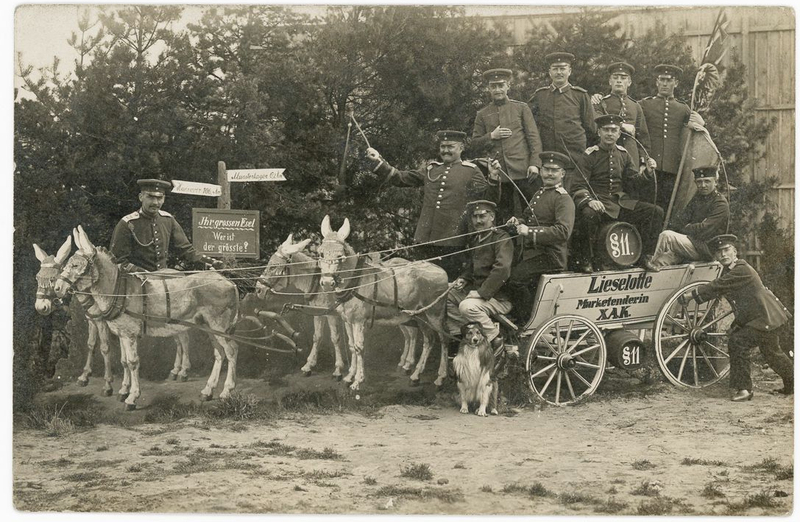 "Lockstedter Military Camp, near Hulsings, Germany. Dornitz Military Camp (Altengrabow), Germany. 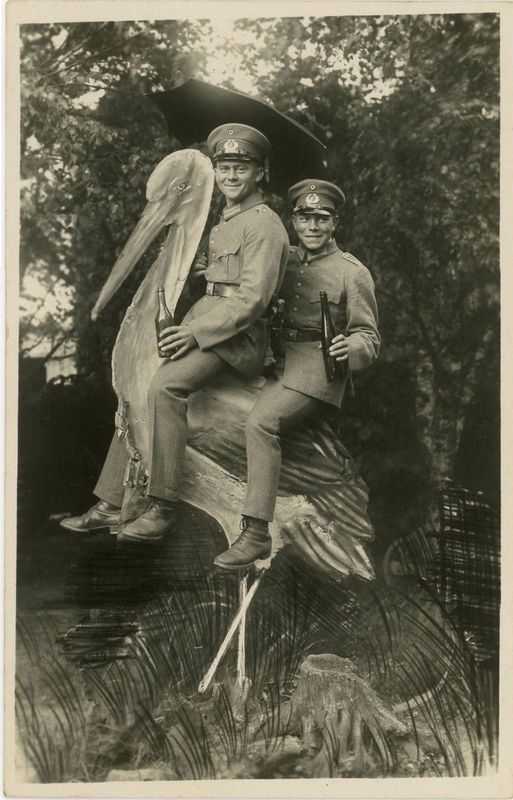 "German soldiers on wooden cutout stork. 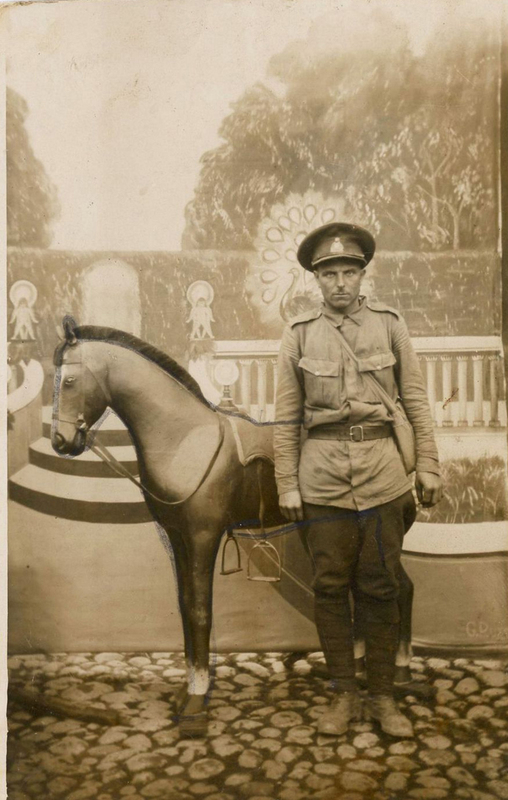 "Soldier posing with fake horse infront of painted backdrop. 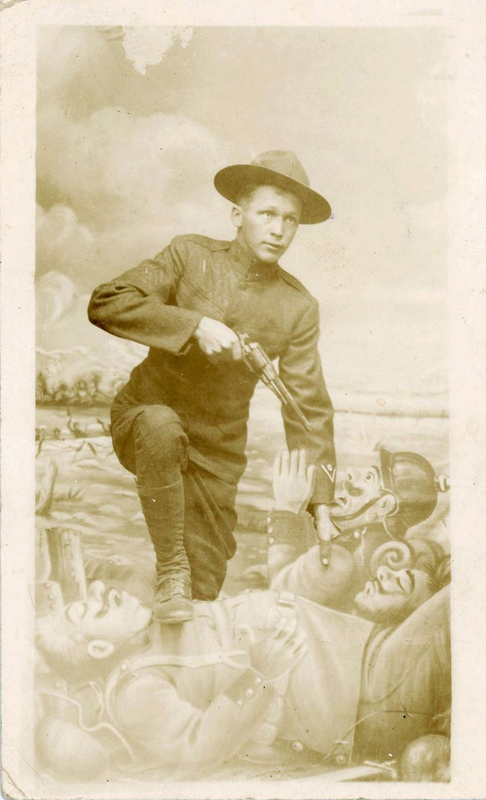 American soldier pointing his revolver at German infantry studio Prop. 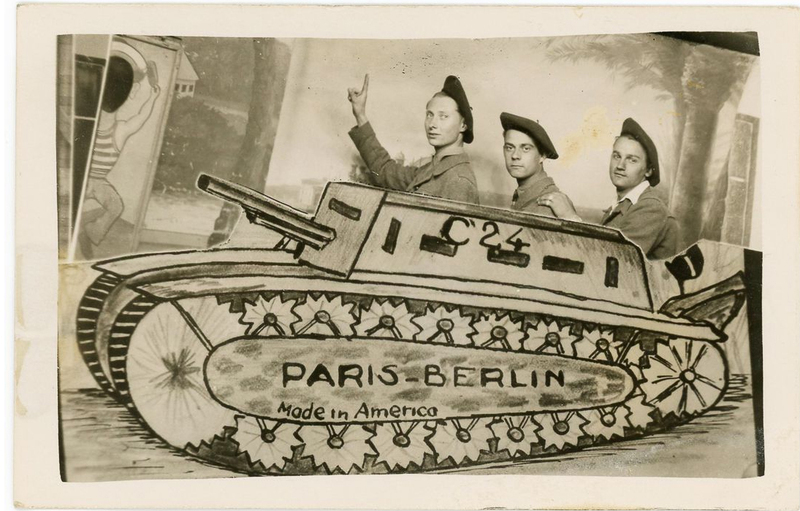 French soldiers in studio tankprop.